The argument was fierce over which of these dishes was better. Although different, both were very good. The metal skewers allowed the meat to cook perfectly so it was very tender, leaving all judgment hanging on the marinade. 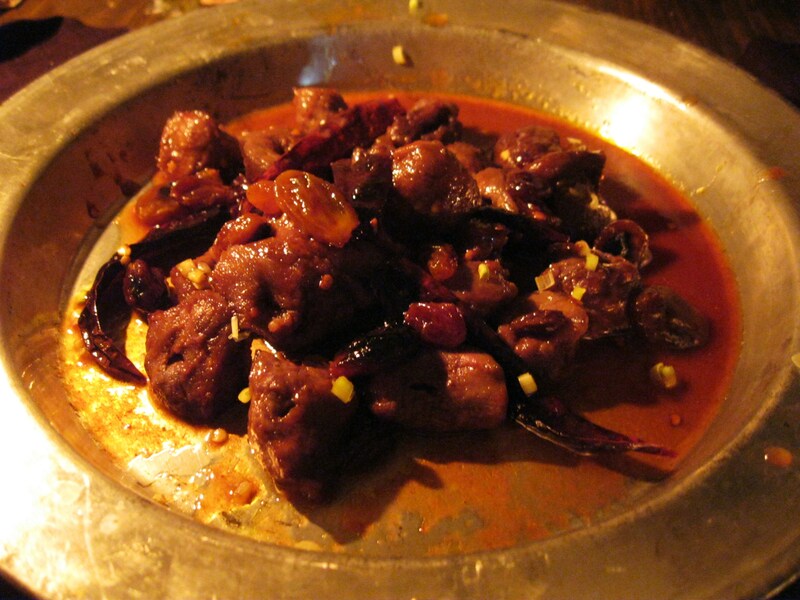 The medieval goat dish was succulent and flavorful. The garlic, salt, and pepper are a tried and true combination, and one that in this case really complimented the slight gaminess of the goat. While it was tasty, it struck several of us as generically medieval (if such a thing is even possible). This dish seemed more appropriate to the clansmen in the Mountains of the Moon than the nomadic Dothraki. In contrast, the modern dish made me feel like a princess on the plains of Vaes Dothrak. I could practically smell the sweat of horses and feel the wind blowing through grass tents. This dish had an exotic feel that was lacking in the medieval version, and that, for me, made the difference. The complexity of the ingredients, and the interplay of sweet, tart, savory and spicy is lovely, and I found myself tempted to lick the plate at the end of the meal. Bottom line? Medieval if you want medieval, Modern if you want Dothraki. Note: These recipes are predominantly for the meat marinade. They would be delicious on any number of meats, including goat. We took our goat, let it marinate, then arranged it on metal skewers. We then stuck it under the oven broiler for a few minutes, turning midway through. Recipe for a Pot-Grill*, Good for the Old, the Delicate of Body and for Weak Stomachs. Take young fat meat, cut it small in a clean pot with a little salt, pepper, thyme, a little murri nagi, 2 cloves of garlic, and what oil is wanting. Place it in on a moderate fire and stir it until it is done and spent. On stovetop, mix ingredients to together until garlic begins to brown. Marinate the goat meat and let sit for 1 to 2 hr. Thread meat on skewers and grill over charcoal or roast until done. Heat oil on stovetop. Add the cherry juice, tomato paste, raisins and the pepper pods, then stir gently. The peppers will start to soften and release their seeds, and the sauce will start to reduce slightly. Stir in the honey, and remove from heat. Give the marinade a taste at this point, and add more pepper if desired. Marinate the goat meat at least an hour (keep the peppers) then thread onto skewers. Grill or roast accordingly, then garnish with the chopped lemon grass and peppers before serving. 1. 1 Cook the honey in a small frying pan on medium heat, bringing it to a boil then turning off the heat and repeating several times; it will taste scorched. 2. 2 The bread is sliced white bread, toasted in a toaster to be somewhat blackened, then mashed in a mortar. Or, toast breadcrumbs in a dry skillet until very very dark brown. 3. 3 Toast the anise, fennel and nigella in a frying pan or roast under a broiler, then grind in a mortar with celery seed and walnuts. 4. 4 Peel and core quince. 5. 5 Boil all ingredients except the lemon together for about 2 hours, then put it in a potato ricer, squeeze out the liquid and add lemon juice to it; this is the murri. The recipe generates about 1 1/4 to 1 1/2 cups of liquid. You can then add another 1/2 cup of water to the residue, simmer 1/2 hr -1 hr, and squeeze out that liquid for the second infusion, which yields about 1/3 cup. A third infusion using 1/3 cup of water yields another 1/4 cup or so. Great suggestion, and thanks for including the recipe. We opted for the simpler substitution of soy sauce, but it’s great to have this as an alternative. Maybe one of these days we’ll try the full fledged version! Some friends and I made the modern goat recipe tonight, for part of a “Dothraki Feast.” We substituted lamb chops for goat skewers, but it came out FABULOUS. That sauce is wonderful. With it, we had olives, flat bread, artichokes steamed with lemon and garlic, and grilled portobello mushrooms, tomatoes, and fennel. Tahini cookies for dessert – they came out strongly resembling halvah. What would you recommend instead of goat meat? I have never seen that for sale here in Sweden. If you’ve got lamb, that would probably be the closest meat for flavor. The key to these recipes is really in the marinade, though, so feel free to experiment with what’s available. You may have access to meats that we don’t, so we’ll look forward to hearing how your dish turns out! Lamb is going to be your best bet, but any dark meat would suffice, depending on if you could get your hands on something like deer. Goat meat vs. Lamb would be much the same change as Beef vs. Veal. The lamb will have a much milder flavor and it takes less time to cook since the connective tissue and long proteins haven’t had time to develop. Either way it’s a feast fit for Robert himself. 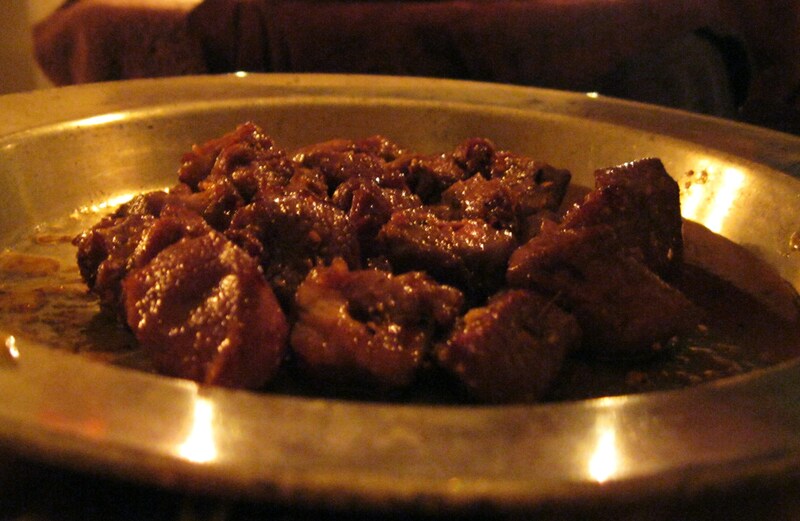 Afro-Caribbean stores will often carry goat meat. Any halal butcher is a likely bet as well. To be honest though, if you ask a good butcher to get a bit of something in for you, be it goat or hogget or rare breed pork, they should be able to help you. Sweetgrass seems to be mentioned several times; this is presumably the same Hierochloe odorata that is used in flavouring Zubrowka and as an incense. Have you tried this with an ingredient that has appropriate quantities of coumarin? — sweetgrass, sweet woodruff, or chamomile? Those are interesting suggestions. We’ve been using lemongrass, but would definitely be interested in variations! I strongly agree with this. When I read the book I took mention of sweetgrass to imply the presence of coumarin. Just a word of caution though; coumarin is volatile stuff and not for everyone. I believe it can react badly with St John’s Wort, so don’t eat it if you take that herb. What do you mean by “dried pepper pods”? Do you mean a dried chile? Love the sound of the ‘modern goat’ recipe and especially the sweet marinade – any suggestions for a wine to match this meal??? Red pepper, and all Capsicums, wouldn’t be available to Europeans in the Middle Ages. It is native to the Americas and was introduced to Europe and Asia during the Columbian Exchange, which began at the end of the Middle Ages. The recipe refers to black pepper. Yep, you’re correct. However, as with many of our recipes, we tweak the historical versions to better suit the description in the books, or our imagined reality of the dish. So, in this case, we wanted a warmer flavor than black pepper offers. to say the Americas and their foods hadn’t been discovered yet and so should were not available to Europeans in the Middle Ages doesn’t matter in a world in which the Americas and Europe both don’t exist! Did the medieval recipe tonight with lamb chops and the suggested substitution of miso paste. It was wonderful! Thank you so much! I was wondering how spicy these are? I want to make them for a GoT party I’m having, but I do have a few people attending who don’t like spicy. If it is very spicy, should I make something else or is there a way to cut the spiciness without killing the flavor? Any suggestions would be great! Thanks. It all depends on what chiles you use. I used four little chile pequinos (very hot, fruity taste, look a bit like red raisins) and four chiles de arbol (very hot bright taste, bright red, skinny peppers about as long as your pinky finger). This turned out very hot, and the cherry and honey didnt really tone it down so much as complement the heat. Unless you and your guests are used to spicy food like Indian, Thai, or Latin American cuisine, i’d stick to using milder peppers like chipotles (short fat black peppers, with a medium smoky flavor) and anchos (medium, fat black peppers, with a mild heat level and rasiny taste). Salt will always cut your piquancy a lot, while acids and most fruits will likely bring out more heat out of your spices. I just made the modern version on skewers for a s2 premiere party, and they went FAST! I used a leg of lamb instead, michigan cherry liqueur, and a mix of chiles pequinos and arbol. I also doubled the sauce and reserved half of it for basting. Turned out very VERY HOT, which was weird for some guests, but perfect for others. I made this for dinner tonight but with chicken for the meat and chinese red chillies for the pods, It came out great in spite of my deviations! If the modern goat had raisins and pepper pods in it, and the medieval did not, it would seem the two photos are reversed. Not that it matters, the both look tasty, but thought I’d ask. I was wanting to make this for the premiere this Sunday but was wondering if I can leave the meat to marinate overnight? I’m using lamb instead of goat if that matters. Although I have not tried the medieval dish yet, I suspect it was originally cooked with sesame or olive oil. This would be because the dish mentioned can be found in “An Anonymous Andalusian Cookbook of the 13th Century” which contains recipes from al Andalus. the Moslem territory from 711-1492 AD that became Andalusia later. Also, for the same reason, the pepper used might have been long pepper (also known as Indian long pepper or pippali) which was a hotter pepper than black pepper. It can be found in Indian grocery stores. What is 2 T oil? roast accordingly – too vague. If one roasts, in the oven, then what temperature and for how long???? What cut/piece would you reccomend if I could track it down? The quote “She brought back a haunch of goat and a basket of fruits and vegetables. Jhiqui roasted the meat with sweetgrass and firepods, basting it with honey as it cooked…” is from A Game of Thrones not ASoS. I’m re-reading the book now and paused to search what a firepod was when I came across this page. Dishes both look very appetizing though! May have to try making them myself.